When exploring the novel, the reader creates non-renewable reading paths in the aesthetic fissures of the work, which take him to a mango tree that tears multimedia poetry lines. 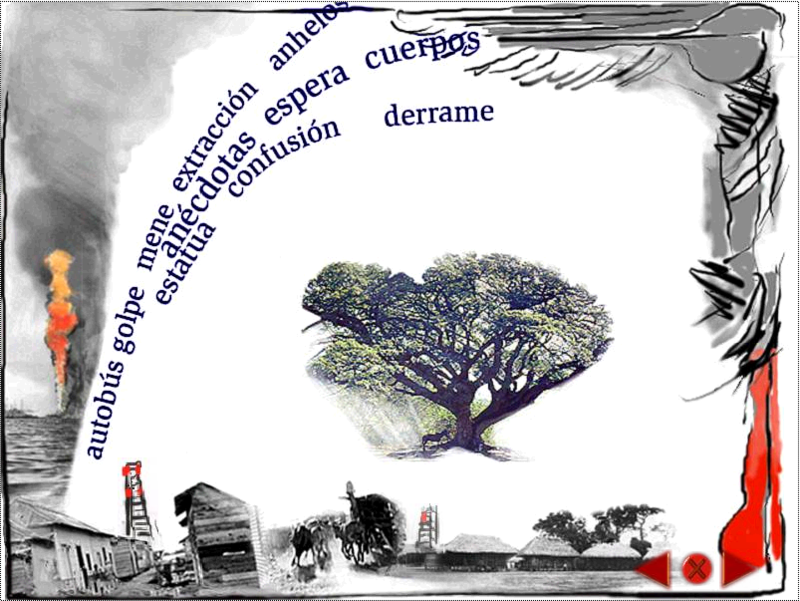 The mango tree feeds from memory; it feeds from the blood of those who perished during the Revolution or the construction of Zumaque I, the first big Venezuelan oil well. The idea of oil tinges of memory is emphasized by the suggestive watercolors that accompany the interactive narrative. Once more, the technique of music guiding the plot can be appreciated for there are times when the song being played tells a different story from the one being read or painted. Let us not forget that not all the multimedia layers of the work are activated at the same time. There is independence between interactivity and narrativity. As aforementioned, at times a picture, a watercolor or a song might narrate more than a thousand clicks. Memory games and intertextuality of images play an important role in Chiappe’s work. At times, navigation might be guided only by visual memory and aural recollection. A selection of photography and paintings of Menegrande from specific periods of the 20th century underline the richness of the different arts that compose the works’ historical hyperphony. 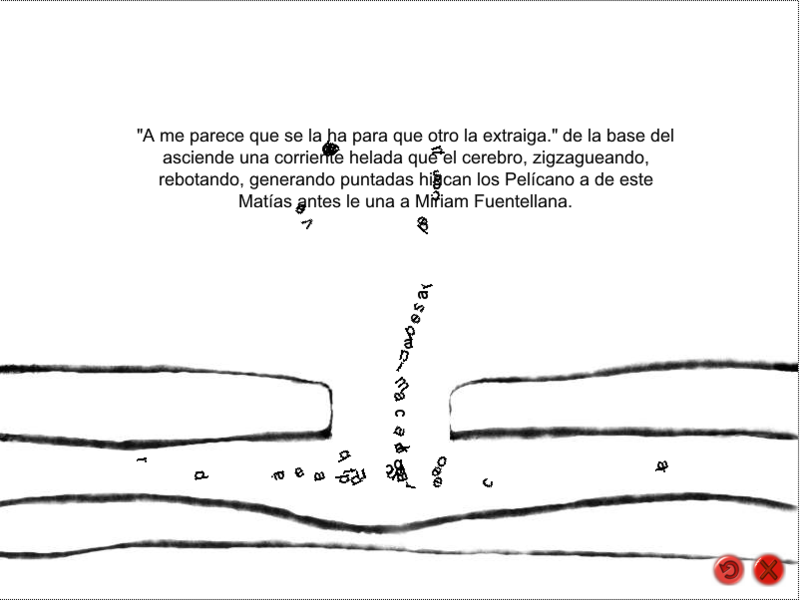 The author uses the metaphoric effect d’amont en aval (upstream and downstream) to show the importance of artistic cooperation behind an electronic literature work. One of the recurring figures of animation that is found in the narrative is ciné-gramme (Saemmer, 2012) that is when a strong relation between what the text does and what it says is created. This can be observed in the chapter (¡Milagro!/Miracle!) where words fall into the fissures of the Earth, and then rise and evaporate from it as the narrative voice suggests, “A veces me parece que esta tierra se la ha tragado para que otro la extraiga” (sometimes it seems to me as if this land has swallowed it so that another can extract it).